Made by a company well-known for their [sic] steam launches, the Ofeldt steamer had a V-twin engine and tiller steering. Later the company built a 4-cylinder steam engine and fitted it to a delivery wagon, but it is not certain how many passenger cars were actually built. 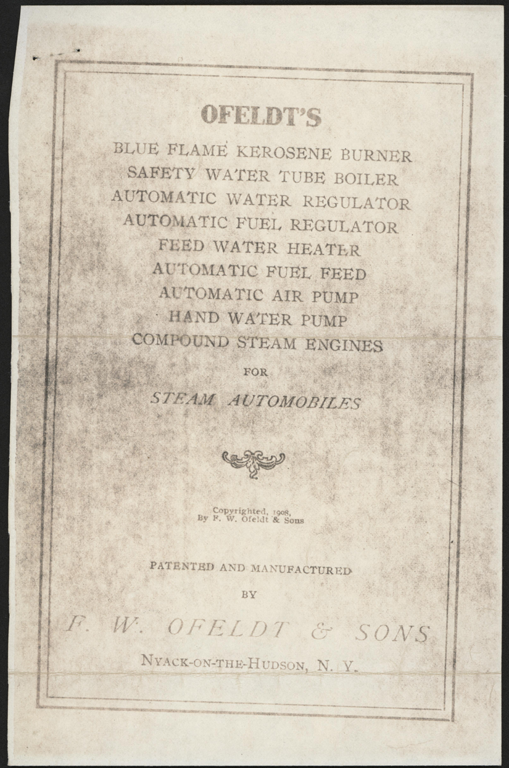 F. W. Olfelt & Sons produced steam automobile aftermarket burners and boilers early in the 20th century. Its advertising indicated it would build steam automobiles to a customer's specifications. One Olfelt advertisement listed its address as Foot of 25th Street, Brooklyn, NY. In 1908 and 1909, the Company listed its location as Nyack-on-the-Hudson, N.Y..
John Conde has F. W. Olfeldt & Sons located at Jackson-on-Hudsonm NY from 1887 - 1894. His notes list the "Olfeldt Automoblie & Steam Launch Company" as being in Newark, NJ from 1900 - 1901. Further research would be productive. These two pages may or may not be from the same trade catalogue. The page on the left lists Olfeldt's products and services. 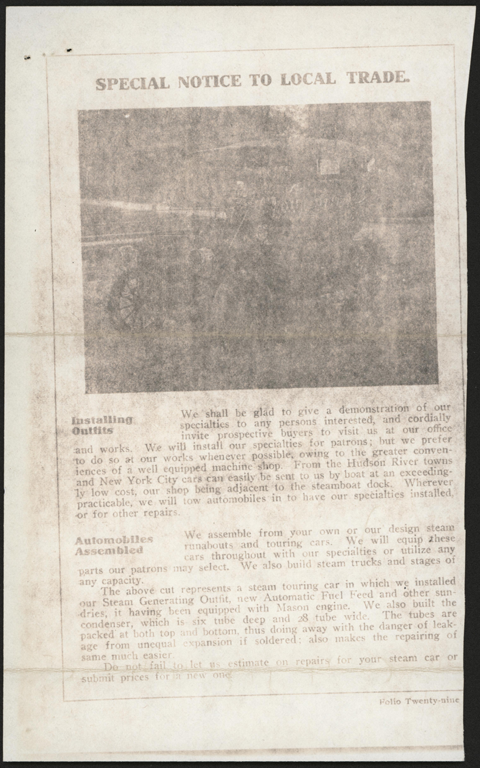 The page on the right offers the service of building or remodeling a steam automobile. Photocopy. John A. Conde Collection. 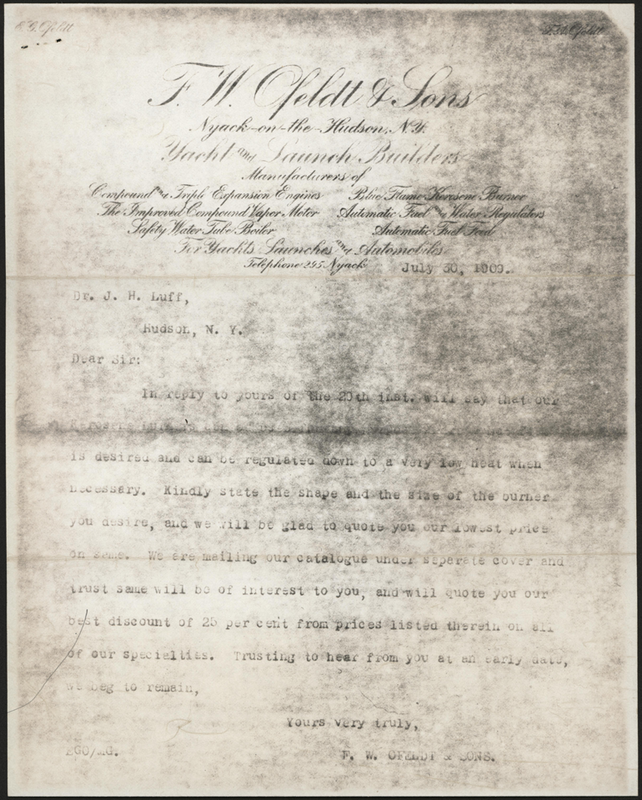 Dr. J. H. Luff of Hudson, NY wrote to Olfeldt on July 16 1909. Olfeldt replied on July 30th, asking Luff for measurements so Olfeldt could quote the price for a new boiler. The age of this deteriorating photocopy makes one line unreadable. The VSCM would like to know from whom Conde acquired these photocopies. Photocopy. John A. Conde Collection. John A. Conde's File Folder. Conde's Olfeldt material consisted of only three, early photocopies. The VSCM would like to know from whom Conde copied these pages. John A. Conde Collection. F. W. Olfelt & Sons Magazine Advertisement 1904, Cycle and Automobile Trade Journal, p. 463. This advertisement is found in Floyd Clymer's Steam Car Scrapbook, (1945, Bonanza Books, Crown Publishers, Inc.), p. 36. As with almost all of the illustrations and f_w_material in his Scrapbook, (a very appropriate description) Clymer lists no sources. 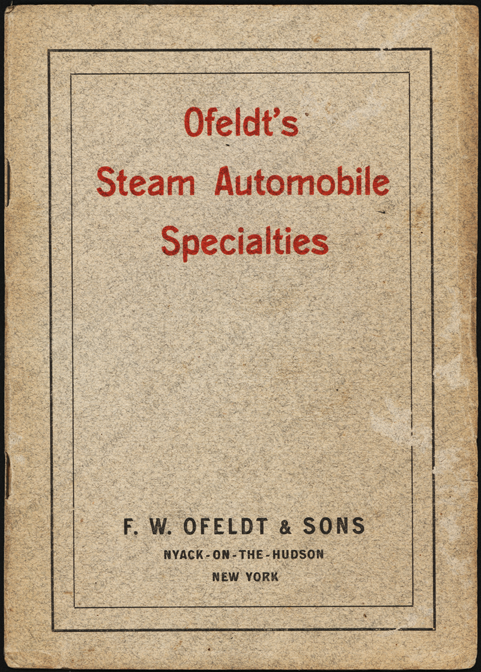 Ofeldt produced this 32-page catalogue in 1906, at a time when the steam car industry was in steep decline. An early page states "The Old Firm in a New Location." 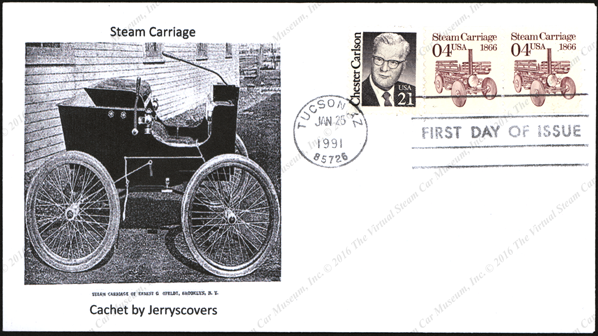 This January 25, 1991 first day cover for the Dudgeon Steam Wagon carries an image of the Ofeldt Steam Carriage. The inscription reads, "Steam Carriage of Ernest G. Olfeldt, Brooklyn, N.Y."
Georgano, G. N., Encyclopedia of American Automobiles, (New York, E. P. Dutton & Co., 1968), p. 144. Contact us if you have additional information about the F. W. Olfeldt & Sons, or if you have questions.